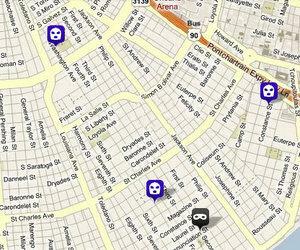 Three more armed robberies have been reported in Uptown New Orleans this week, including one in which a man was shot while trying to run away from his assailants, police said. Around 8:30 p.m. Monday, a woman walking home on Chestnut near Washington in the Garden District was approached from behind by two men, one holding a gun while the other snatched her purse away, said Sgt. Sandra Contreras of the NOPD Sixth District persons-crimes unit. About two hours later, a man who walked out to his car in the 1000 block of Thalia in the Lower Garden District was confronted by two men, Contreras said. Again, one held the gun while the other demanded the victim’s property, but the victim refused and tried to run away, Contreras said. As he ran, the gunman fired 10 shots, one of which struck the victim in the buttocks, Contreras said. Based on the similarities in the suspects’ behavior, police believe both robberies were committed by the same people, Contreras said. Investigators were able to trace the cell phone stolen in the Chestnut Street case to the Bunker Hill neighborhood in New Orleans East, but when Contreras drove there to seek out suspects, she said she was surprised to find entire communities of former Uptown residents who had relocated. “Almost everybody in that age range (of the robbery suspects) in that area had either lived in the Sixth or been arrested in the Sixth,” Contreras said. A third robbery took place just before 8 a.m. Thursday, when a woman walking to the bus stop for work was approached from behind near Washington and South Roman by a man who put a gun to her back and took her belongings, Contreras said. The victim described the gunman as being a 5-foot-10, 150-pound black man on a bicycle, and told police he looked as though he was on drugs, Contreras said. Investigators said it’s possible that the same perpetrators in the most recent cases could have been involved in the rash of robberies through Uptown New Orleans in May.